✦Receive an authentic Israeli Handmade "Shmura Matzah". ✦Have the Time of Your Life! 3D Video & Glasses + 4D Special effects + "building" a Seder plate by Lowes =Ready for Passover! 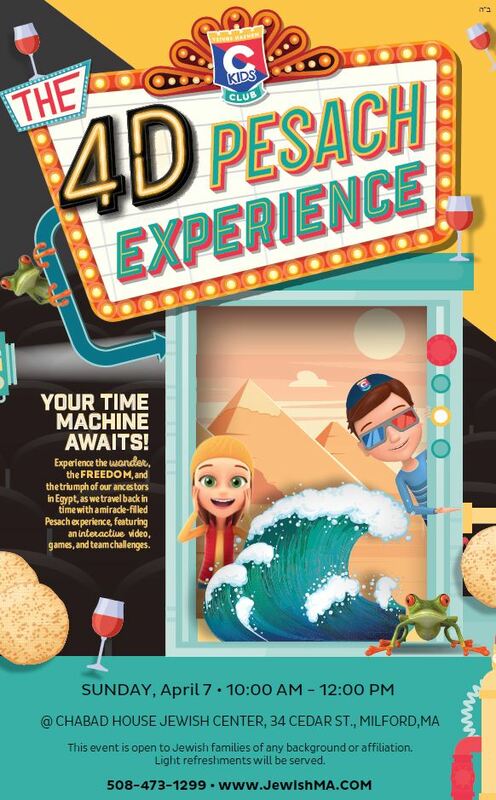 3D Interactive video takes the children back in time to the Jewish enslavement and the journey to freedom. The program will include a 4D component, blending video with with special effect that are FELT by the audience... It'll give your children and you a whole new understanding of the Passover story and seder. Additionally the staff at Lowes will be supplying materials and instructions for the children to make their very own Seder plate! Online advance reservation just $10 per child! At the door: $15 per child. Hebrew School Families: Free of charge. 123456 $10 per child. At the door $15 . 1234 Children must be accompanied by an adult. Parents, grandapernts or guardians are invited to take part, by assisting their children and/or watching the program.